An accessory that offers years of future use, this three-bottle wine tote is one of the most unique and beautiful ways to give the gift of wine. Tote arrives with your choice of premium wine trio, and features a detachable shoulder strap, inner partition to ensure safe transport, and a collection of sturdy wine tools. See the Tasting Notes Tab for more details. Comes equipped with pour spout, wine opener, and stopper to allow for easy enjoyment. Measures 15" x 7" x 7". Wine Trio Travel Tote is a hand delivered gift. These gifts are delivered by one of our local design centers located throughout the United States and Canada. Same day delivery is available for most gifts when ordered before the cutoff time. The cutoff time for Wine Trio Travel Tote is 2 PM in the recipient's time zone. Cecchi Chianti ClassicoA robust ruby-red wine with well-extracted acidity and aging potential. Benvolio Pinot GrigioA vibrant, floral expression of the Grave de Friuli terroir. Simi ChardonnayA glimmering Chardonnay with tropical fruits and a hint of smoke. Produced in the high hills of the historic Chianti region, this robust ruby-red to garnet wine has an intense bouquet of iris blossoms and licorice. The palate proffers cherries, earthy underbrush, and a drying dose of well-extracted acidity. Enjoyable now with potential to expand with age. Your choice of acclaimed wine trio. A collection of sturdy wine tools. A suede shoulder tote for the wine. This was received with Great Reviews. The receiver was very surprised and Happy. I'm sure I'll be sending again. My daughter and husband moved to California after they were married. Sent this gift for their first wedding anniversary -they loved it. She stated that "she had no idea her parents were so sophisticated". My original order was damaged in shipment and discarded by the shipper. I contacted Gift Tree and they immediately overnighted a replacement. Purchased this for my boss! He loved it! And It shipped on time. I will surely purchase again! Bosses are tough to buy for and over the years I have never gotten such a positive reaction as I did this year with the Wine Trio Travel Tote. Thank you Gift Tree. I know where to shop next Christmas. I sent this to my realtor, as Thank You for getting me the Condo..
of my dreams. He was stunned and delighted with this gift. This will become my go to gifting company for years to come. Will be getting a set for my birthday. Sent this as a gift, package arrived as scheduled and without damage. Recipients were very pleased, and stated the wine selection was delicious! The service was certainly outstanding. I forgot to add my choice of wine so I sent a follow up email to request the change and I got an email back instantly noting the change. Fabulous service! This item was sent to a thirty something couple who are wine lovers. They seemed to be very happy with this gift. I ordered 11 of these as gifts for my co-workers and all were very appreciative and impressed with the overall quality. The set looks great and appears to be well constructed. I have no issues recommending this gift set. Given as Xmas gift, Very pleased! Given as a Xmas gift. Very pleased. This gift was amazing. I was hesitant when opening it up but I was beyond pleased. It isn't cheaply made and looks more expensive than it actually is. Thanks for this! This was a thank you gift for some friends who had given a wonderful tour of their town on our visit! I was so delighted it was something they would enjoy (wine) use (wine carrier) AND it was ordered and arrived so quickly! Will definitely use this site again! Easy to purchase, arrived on time. Recipient was happy! Can't ask for much more than that. The quality of the wine tote is very good. The wines were great. I recommend this as a gift or for yourself! They loved the fact that it is a gift that they can continue to use for travel. Great presentation, nice quality. Great present. This was a gift and our friends loved it. Greatest deal for your money and the quality is the best. If you know someone who loves Italian wines, then this gift will really be a treat for them. I purchased this for an anniversary gift for my parents. They have been married 60 years and I really had no idea what I would get them. They do quite a bit of traveling and I thought this would come in handy. They LOVE it! Sent it as a gift to someone. They absolutely loved it. Case is solid. Wine gift baskets may look pretty, but all too often, the wine is not very interesting and the assorted treats included along with it seem rather random--and not always the best quality. 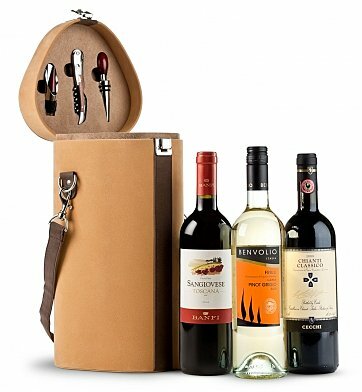 This gift is all about good wine, and the unique triple wine tote is a nice (and useful!) addition. It went over very well. We ordered several of these to give as client gifts. They all arrived very well packaged and present a very nice and useful gift! This is the 2nd year in a row we've ordered multiple client gifts from GiftTree and we couldn't be more pleased! I highly recommend them! The tote is really nice...the wine is, of course, great. The engraved plaque is not really worth the $10.00. It would be better if it were somehow attached to the tote instead of hanging from a bottle. Overall, I am very pleased. The shipping was SUPER fast! This gift was ideal. I was nervous about the customization but that was what my brother liked the most. This was a birthday gift and tottaly worth it. I was very nervous if it got delivered on time but they sent me an email right after the delivery was done. Mom & Dad LOVED IT !!!!! I purchased for my parents Anniversary. I order from GiftTree every year, I love the reminder they send and the extra 10% off they sent as a "thank you". I have never been disappointed, I am very particular...that's why they get my repeat business.